On Wednesday 27th March 2019 Lydia Buckmaster the Training & Account Development Manager from Medimark Scientific Ltd visited Guernsey and the GSPCA to provide training to help with the cleaning process and understanding how to use Anigene disinfectant and similar products during the cleaning process safely and to prevent the spread of illness and disease. In 2017 Rick Hayman Managing Director from Medimark Scientific Ltd came over to do a very similar talk and concentrating on the disease spread of the rabbit disease RHVD2 and how to help prevent spread it. Tomorrow (Wednesday 27th March 2019) Lydia Buckmaster the Training & Account Development Manager from Medimark Scientific Ltd visits Guernsey and the GSPCA to provide training to help with the cleaning process and understanding how to use Anigene disinfectant and similar products during the cleaning process safely and to prevent the spread of illness and disease. 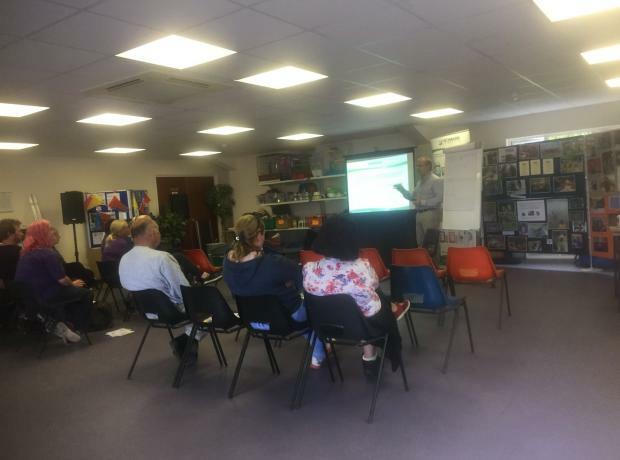 Over the last two days the GSPCA welcomed Rick Hayman who is the Managing Director of Medimark Scientific Ltd who manufacture a number of products that are used world wide to clean in a variety of environments, especially vets and animal shelters. Rick is a massive supporter of animal charities and has even volunteered on a Mission Rabies project which is a charity that vaccinates dogs in Africa and other parts of the developing world to help stop this deadly disease. Do you need disinfectant to clean out your animals? At the GSPCA we clean out and care for 300 animals every day and you can now buy one of the leading disinfectants that we use at the Shelter. 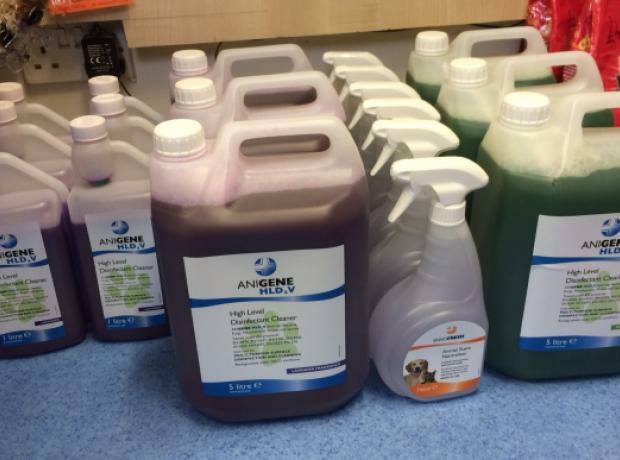 To ensure we can thoroughly disinfect the animal accommodation’s at the GSPCA we use Angiene HLD4V High Level Surface Disinfectant made by Medi-Mark. On sale at reception we have 1 litre self dosing at £9.10 and 5 litre containers for £20.33, but we do have 20 litre drums on request. We also have odour eliminator sprays on sale for those owners with the fragrant pet.